Two ravens (Odin’s eyes and ears). the other, now broken and blind. the hills, they are moving, alive – no, they are afire, like Brunhilde’s prison. their river poisoned and damned. the Grail that holds the holiest of holies. I study the plants, the animals, the wind, the waves. They call me a witch, I say I’m a philosopher. Leave me to my studies and observations. On this tiny island, no one can find me. I almost understand, I’m almost there. That is the Colchis way. as if I cannot hear. They nod meaningfully to each other. I will not be possessed. Sister of Aeetes (keeper of the Golden Fleece). Their flashing swords and ugly words. So arrogant in the presence of the Gods. I took away their humanity. I poisoned these unwelcome guests. I know herbs. I poisoned them. became a rooster that crowed mercilessly. – he turned into a snake. It became an experiment for me to predict their transformations. turned into seabirds and dolphins and slipped away. Preying upon each other, for that is the way of human nature. All that remain are a few old toothless lions and wolves. Guarding the shores from wayward travelers. On the wall, and wonder at the true nature of reality. an ancient land of gold of clay of earth of roots of figs of vine of grapes of god of monks of priests of panthers of occupation of insurrection of reconstruction of resurrection kvevri sit broken unused yet their clay descendants made lovingly by the great grandsons of their makers are buried crucibles of nature’s magic alone for the black wine which is more than wine the first wine the earth the roots the grape the god transmuting over time immemorial never forgotten history that upon which one’s honour lies witnessed by cows strolling freely as their sacred sisters in far away lands udders swollen with milk for cheese as rare as the golden fleece. the gold the earth the roots the vine the grape the god they flex they dare defying dragons defying time’s hot hand that tries to crumble the mortar all crooked stairs musty cellars the sweat the smoke the earth the roots the grape the god the dreamers the poets the painters the singers the dancers and the tamuda who never shirks his duty. cries of gaumarjos – to win! come in dragons come to the supra and feast with us do you dare? your fire cannot burn our dreams our songs our paintings our poems our stories our dances our hearts our will. 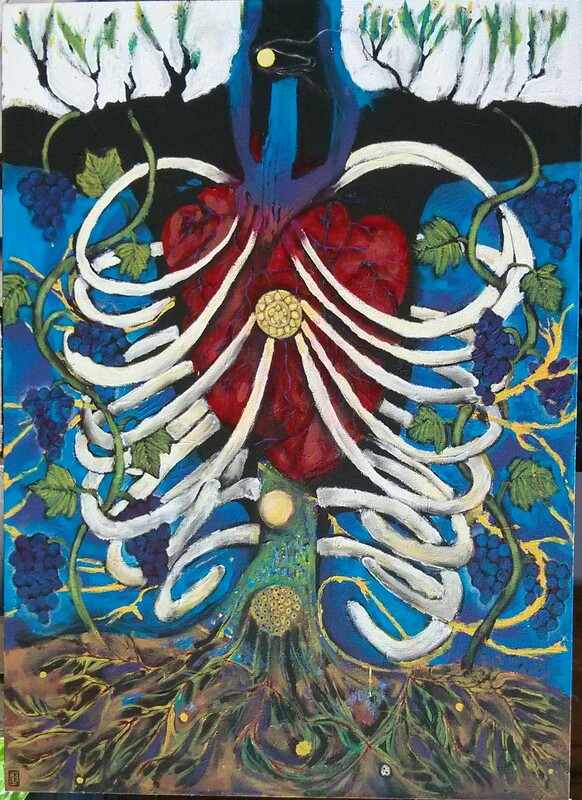 fuelled by your sacred foods your stories your mountains your earth your roots your grape your god king tamar quietly sits behind me watching waiting i paint and paint and paint and find my sakartvelo anahata. *sakartvelo:the native georgian name for their country. 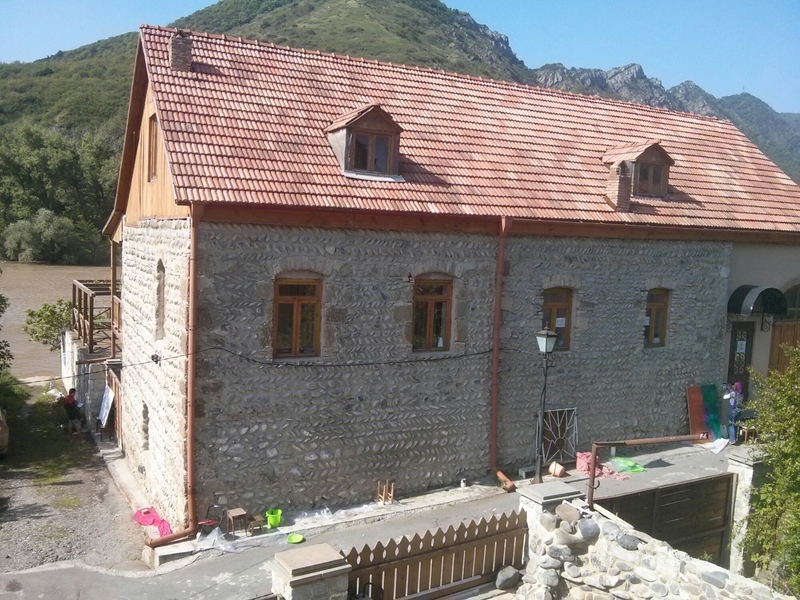 Its root, kartvel-i (ქართველ-ი), referred to inhabitants of the core central region Kartli, later expanded to other areas of medieval Georgia held together by religion, culture, and language. The Georgian sa- (x)-o “the area where (x) dwell”. anāhata: In Sanskrit, anahata means “unhurt, unstruck and unbeaten”. Also known as the heart chakra, it represents selfless love, compassion, courage, healing and interconnectedness (from Hindu Yogic, Shakta and Buddhist Tantric traditions). The genesis of Paint for Georgia (an annual International painting festival held in Mtskheta, Georgia, was in Klaipeda, Lithuania, in 2012. One of the invited artists was Giorgi (George) Tabliashvili, a Georgian painter, illustrator and designer from Tbilisi, Georgia. George and Ieva (a media and installation artist from Lithuania, became friends and talked about bringing a similar festival to Georgia. 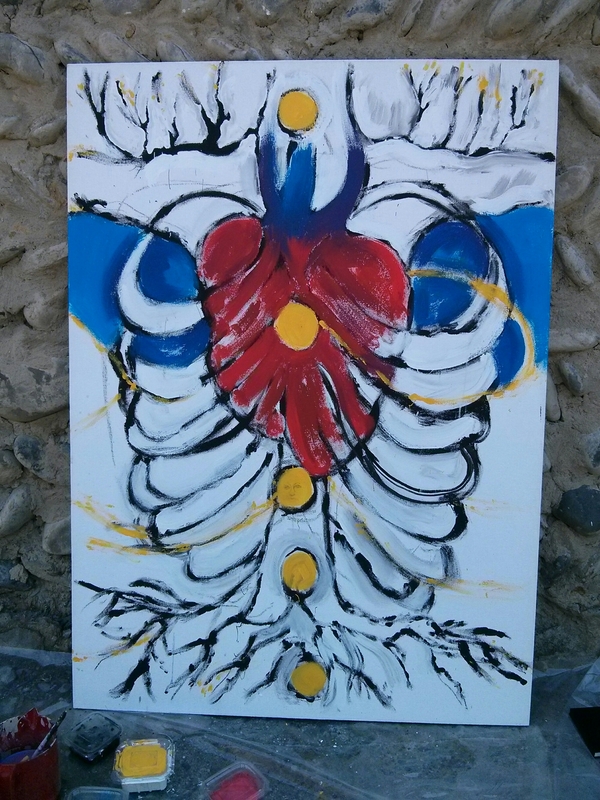 In 2012 the first Connections, Paint for Georgia residency/exhibit took place in the historical city of Mtskheta. It has evolved and grown year by year. Soon, George’s brother Irakli Tabliashvili, a well known and respected journalist and broadcaster came on board as co-cordinator. 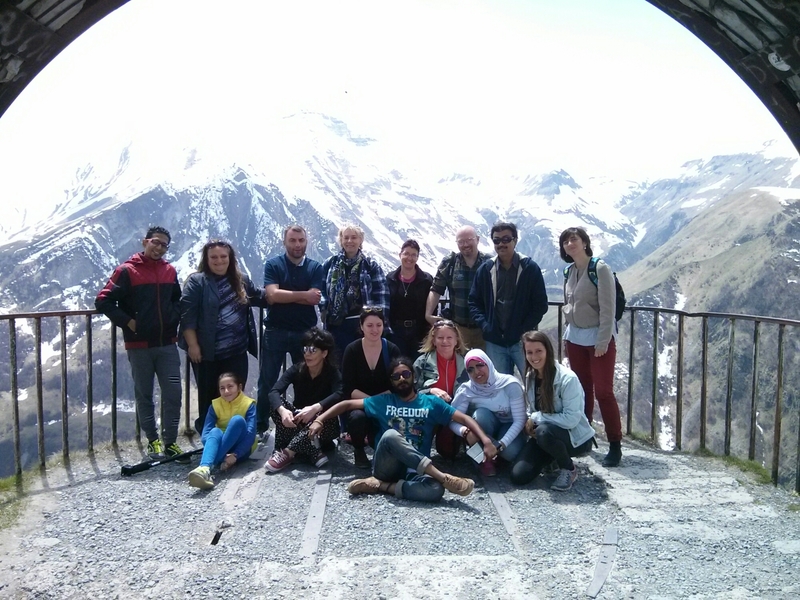 This year, 2015, they host artists from India, Canada, Egypt, Lebanon, Poland, Holland, Iceland, Georgia and England. Ieva now lives in Iceland (no longer with the Baroti Gallery), and has joined us this year as a participant. I heard about the festival from fellow artist Cindy Mersky. She had nothing but praise for the festival, for George, and for the country of Georgia in general. 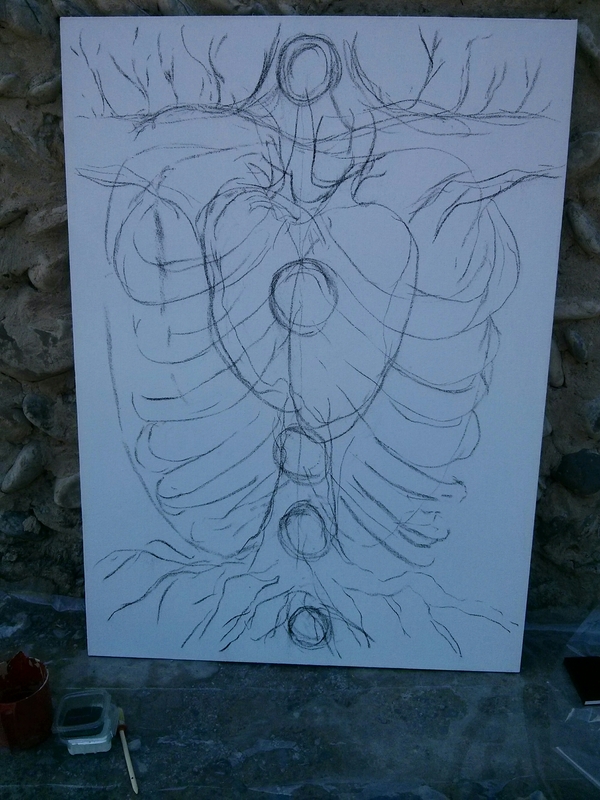 Today, six days into the ten day residency, I can tell you that I think the concept, and especially the spirit behind it, was a brilliant one. Yes, it is called a painting residency, but this year we also have a photographer and a media artist, and somehow, there is a place for them. They are integral members of our group. We are working in a public venue; our paintings leaning against the house across the street from our hotel. It’s quietly active. Local people amble by occasionally, others make a special visit to see us at work. The weather is beautiful and conducive to creating outdoors. 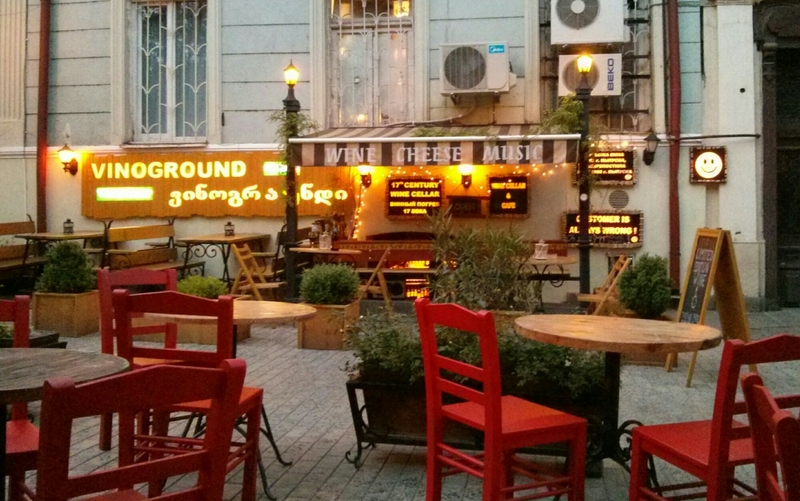 In my last post, I touched on Georgian hospitality. And how better to foster interpersonal and social communication than through sitting down together around a table three times a day; sharing thoughts, stories of home, our art, much laughter, and of course, endless plates of cheese, khachipuri, cups of tea and glasses of wine? In Georgia, there is the Tamada. Traditionally in mixed groups is “he” (among us non-traditional artists it is “she” as well) The Tamada is the toastmaster/host at the table. The toasts are philosophical, thoughtful and poetic, often rambling improvisations. The Tamada can make another member of the party Alaverdi, asking them to give a toast. At our meals, we have each been honoured with the Alaverdi role; with themes such as freedom, friendship, artistic bonds, future artists and, again, friendship. It is a beautiful thing. If I were to give a rôle to each of our organisers, I would say George is the heart and soul, Irakli is the dynamic machine that makes things happen, Ieva is a sort of guardian angel who quietly appears and patiently helps you untangle whatever needs untangling. And finally, I’ve been told that the quiet power behind the scenes that keeps everyone going and on track is George and Irakli’s mother, Marina. 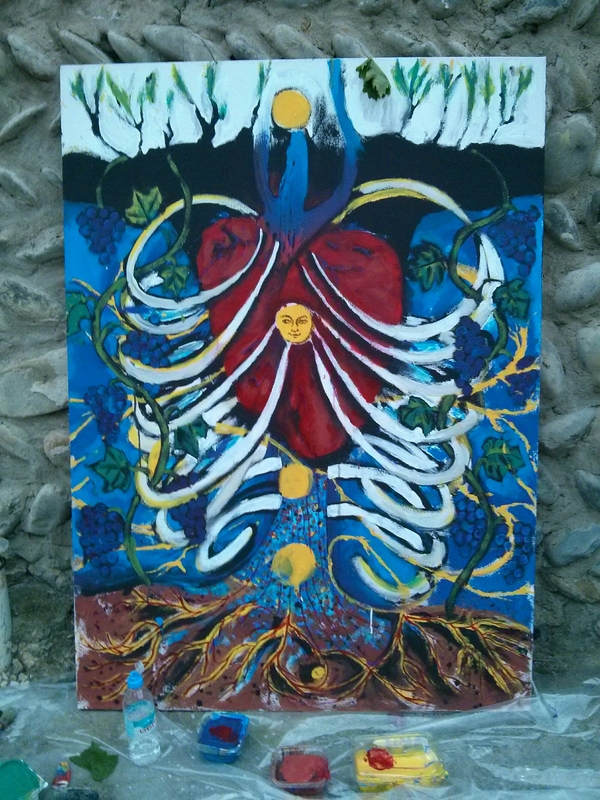 And so here we continue to paint, eat, drink wine, paint, tour incredible ancient sites, eat, drink more wine, tell stories, and paint. I short, what I call Good Old Creative Living. * from the “CROSSINGS 2013” catalogue. 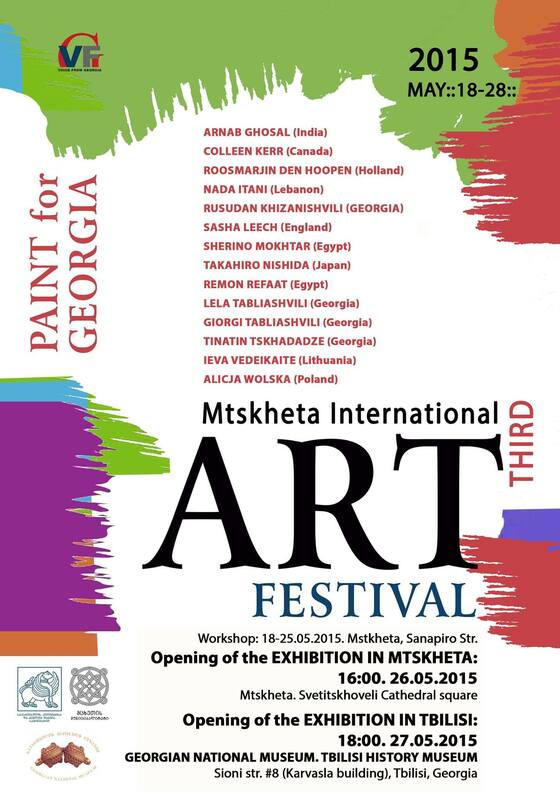 I’m in Mtskheta, Georgia to participate in an international art festival called “Paint for Georgia”. As soon as I was accepted, I realised I knew nothing about the country. 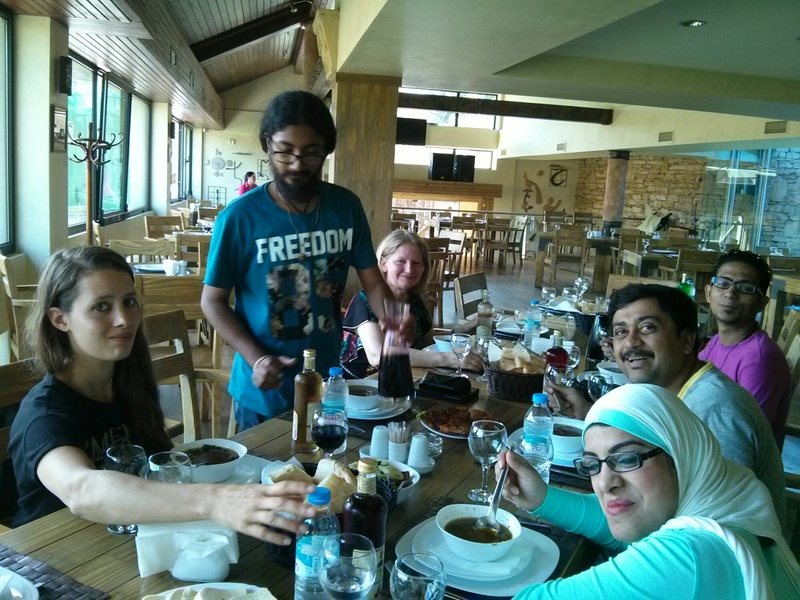 I chose this first photo because I soon learned that Georgia is famous for its hospitality and good food. 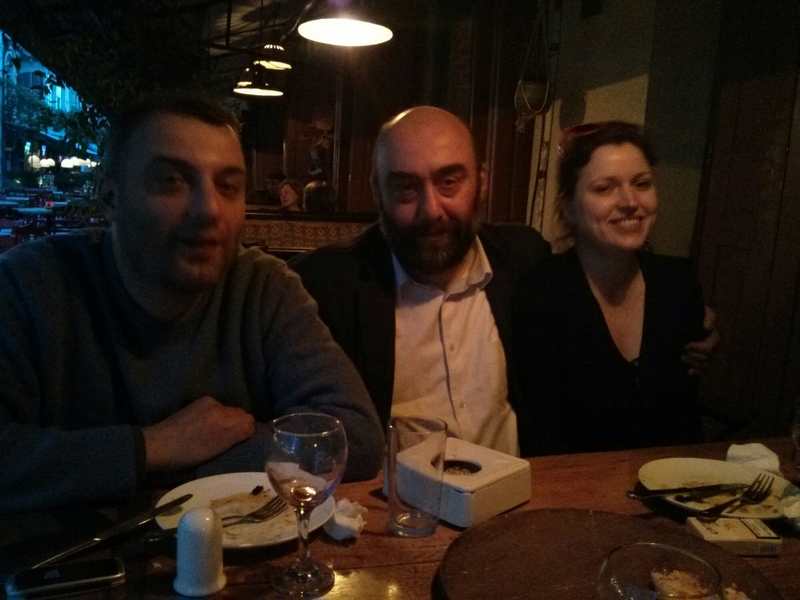 After being picked up at the airport by the festival organisers, brothers Giorgi (George) and Irakli Tabliashvili, we met Ieva Vedeikaite and went for a meal in old Tbilisi. Georgia makes uniquely excellent wine, and while we were waiting for our meal, Irakli spirited Ieva and I across the street to a wine cellar for some speedy wine tasting. We tried two white wines; the first, of Georgian grapes made in the European method, was crisp, light and smooth. The second, of the same grapes, made by the Georgian method, was a characteristic deep amber colour. It tasted similar, but deeper, earthier, and unlike any wine I’d ever tasted. I had travelled two days by air to get to Georgia, so I was beginning to get giddy from lack of sleep, crossing several time zones, and a couple glasses of wine. Arriving at the guest house hotel was a welcome end to the evening. George showed me around, explained that he stocked the kitchen and that we were to help ourselves. He also introduced me to the hotel’s owner, Shote. And that brings us back to the first photograph. The next morning, I stumbled down to the kitchen, and Shote again materialised and began to prepare breakfast for me. I hadn’t yet learned the phrase “ara madloba” (no thank you), and he pretended not to understand my head shaking in the negative and waving of hands. 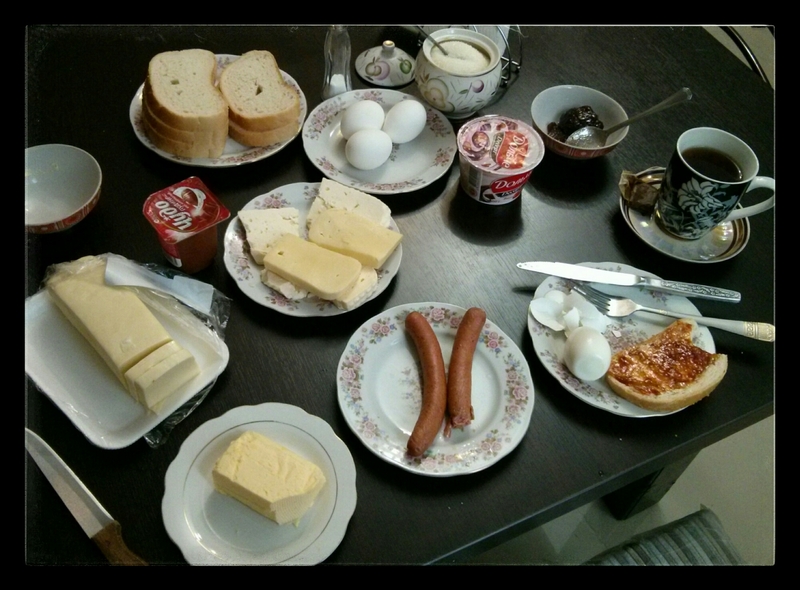 This photo is the breakfast laid out for me alone, the sole guest of the hotel at this point. …Next time, the story of how “Paint for Georgia” began, and the amazing people behind it all. The Human Brain. Avebury Henge. These ancient sites are inhabited by Genius Locii: Protective Spirits. Prominent stones, barrows, lobes were later named after the Christian devil to discredit the significance of the spiritual locus. For genius is amoral, a force of nature and so impossible to reconcile to dogma. Still, after thousands of years, the Genius Locii refuse to obey. 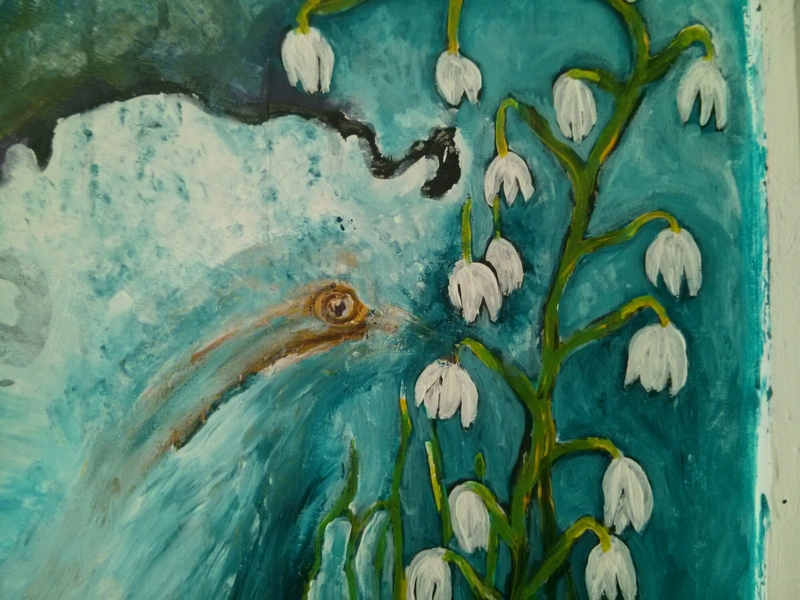 Welcome to the inaugural post of my new art blog! I thought I would start things off by telling you a little about the image I have chosen to represent this page, and about my working process. 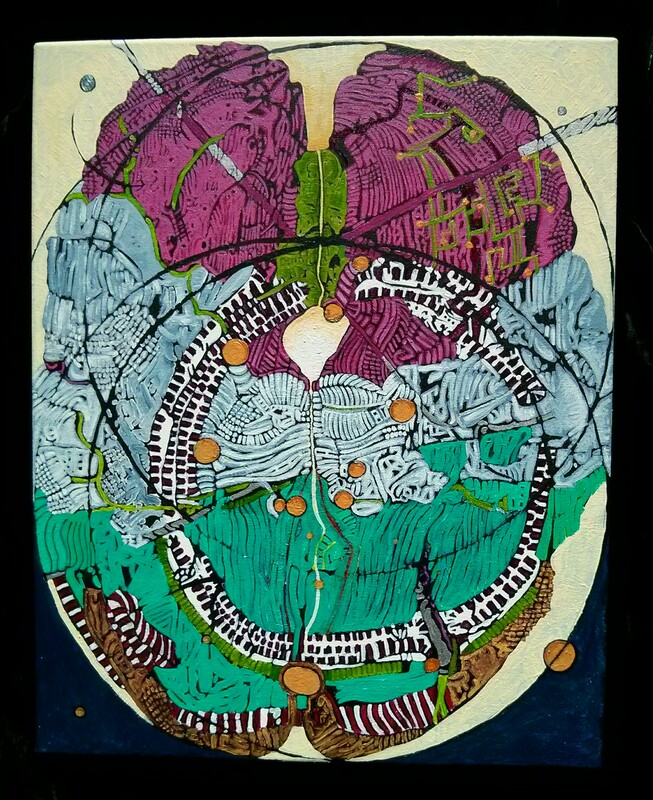 This work is the first in a short series of paintings based on the sensory organs. 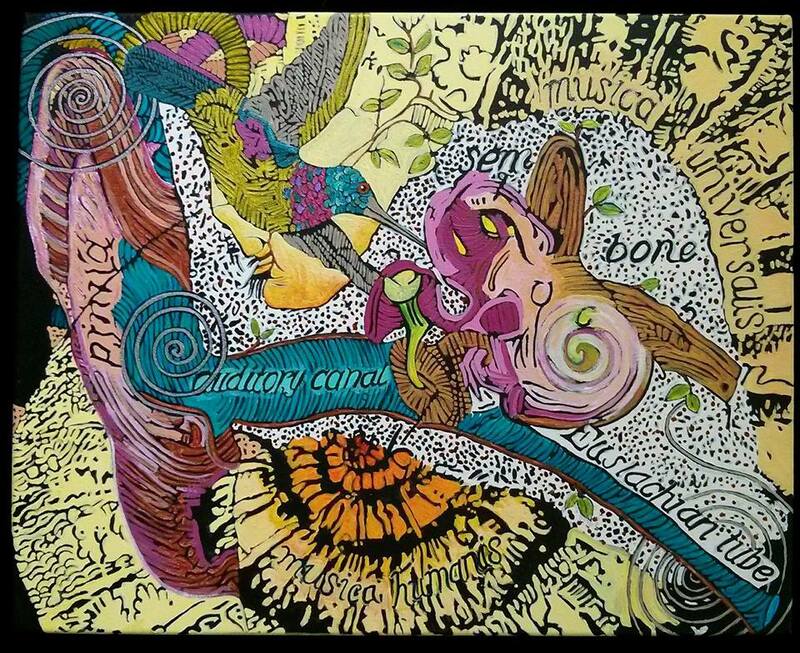 I began with an an anatomical cross section of the human ear, and I soon began to think about the structure of the inner ear; hearing, sound, music and as so often happens: the universe. Like most of my paintings, it started with a basic paint drawing in black and white, then layer upon layer of colour, restructuring the image until the painting tells me it is done. I almost always use the written word to develop my ideas. Often, these words appear in the work (as they do in this painting) and sometimes they are text that accompany the visual art when exhibited. Other times, they are simply notes and quotes that help me look at my idea from another perspective and contribute to it’s (and often my own) development. 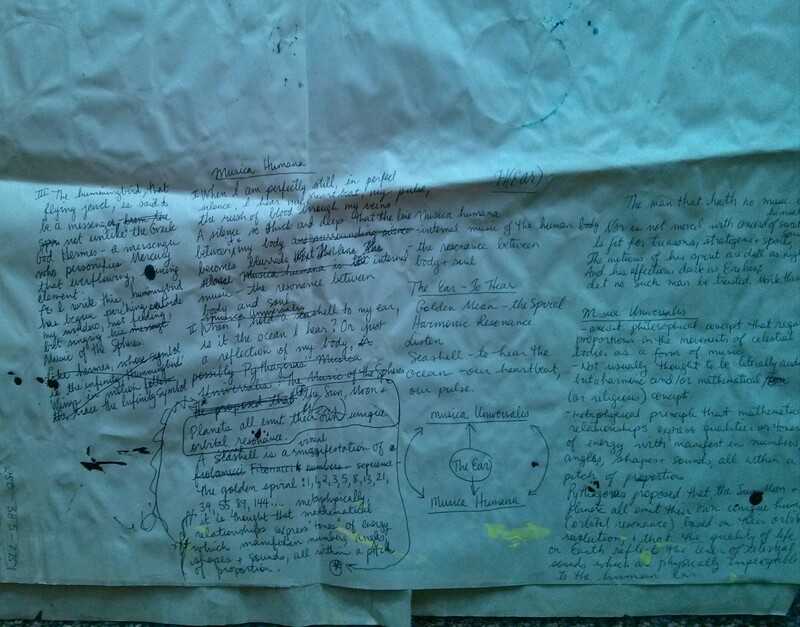 Notes for painting and text development for H(ear).